倪幸, 窦春英, 丁立忠, 石红静, 马闪闪, 赵伟明, 赵科理, 叶正钱. 有机物料对山核桃林地土壤的培肥改良效果[J]. 植物营养与肥料学报, 2018, 24(5): 1266-1275. NI Xing, DOU Chun-ying, DING Li-zhong, SHI Hong-jing, MA Shan-shan, ZHAO Wei-ming, ZHAO Ke-li, YE Zheng-qian. Organic materials improved the soil fertility in Carya cathayensis forest lands [J]. Journal of Plant Nutrition and Fertilizers, 2018, 24(5): 1266-1275. Abstract: 【Objectives】 The great differences in soil productivity and soil fertility are existed among the forest soils with low-yielding and high-yielding Carya cathayensis. Comparing the differences of organic materials on the improvement of soil acidity and fertility will provide a theoretical guidance for the effective application of organic materials. 【Methods】 Carya cathayensis forest lands originated from red soil (low-yielding) and limestone soil (high-yielding) were chosen for the two independent incubation experiments. Four kinds of organic materials, bio-organic fertilizer (BF), potassium humate (KH), bamboo-char (BC) and biogas residue (BR), were supplied into the soils by the rate of 1% accounting for total soil weights, and incubated at a constant temperature of 25℃. Soil samples were collected at 0, 30, 60, 90 and 180 d to measure the soil pH, available N, available P, available K and available micronutrients of Fe, Mn, Cu and Zn, respectively. 【Results】 1) Red soil after incubation of 180 days, organic materials affected nutrient availabilities in different levels. Available N was only significantly increased in the BR treatment and was 52.85 mg/kg higher than control (P < 0.05); all of four organic materials increased soil available P, and those in the BF and KH treatments were significantly higher than in the BC and BR treatments, and were 13.21 mg/kg and 12.07 mg/kg higher than the control ( P < 0.05), respectively. All the four organic materials significantly increased soil available K ( P < 0.05), and that in KH treatment was significantly higher than those in the others, and was 136.00 mg/kg higher than control. Only the KH demonstrated significant increase of soil available Fe and that was 71.59 mg/kg higher than the control ( P < 0.05), the BC significantly increased soil available Zn and that was 0.94 mg/kg higher than control, and no organic materials increased soil available Mn and Cu. 2) In limestone soil after incubation of 180 days, four organic materials did not improve the soil available N, but significantly increased soil available P ( P < 0.05). The soil available P in the BF treatment was significantly higher than those in the other three ones ( P < 0.05), and was 4.67 mg/kg higher than control ( P < 0.05). The soil available K in the KH treatment was significantly higher than those in the other three ones ( P < 0.05), and was 94.00 mg/kg higher than control ( P < 0.05). 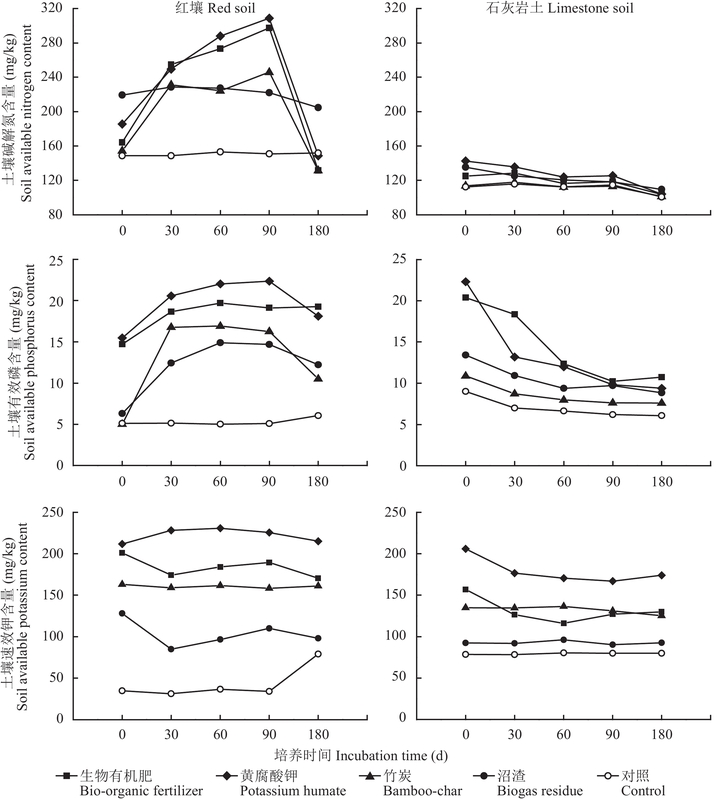 Both the BF and the KH treatments significantly increased soil available Fe, and resulted in an increase of 190.61 mg/kg and 249.43 mg/kg than the control ( P < 0.05) . The soil available Mn in the BF, KH and BC treatments were significantly increased by 135.74 mg/kg, 155.96 mg/kg and 51.51 mg/kg ( P < 0.05), respectively. Soil available Cu in both the BF and the KH treatments were also significantly increased, and were 1.79 mg/kg and 2.99 mg/kg higher than the control. Available Zn was only significantly increased in the BR treatment, and was 3.23 mg/kg higher than the control ( P < 0.05). 3) In red soil (pH 4.46), only BR increased soil pH, and reduced soil exchangeable Al 3+ by 3.04 cmol/kg than the control (P < 0.05). 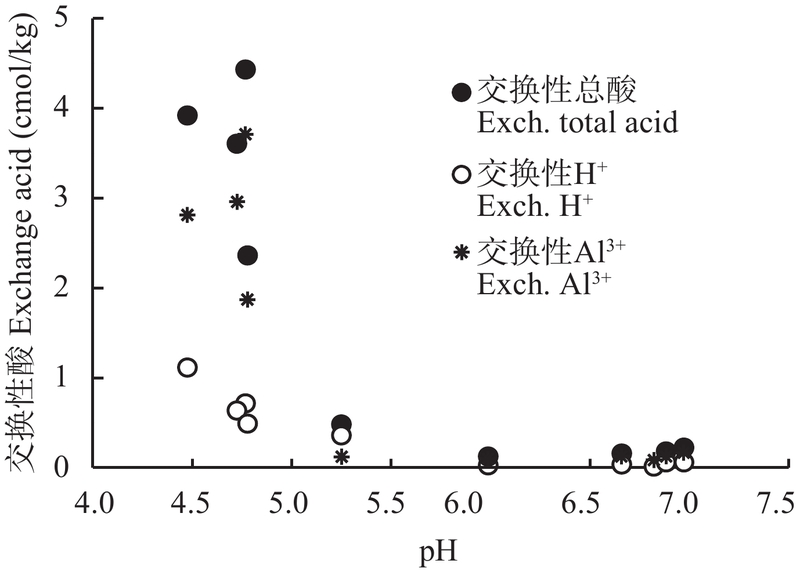 By contrast, in limestone soil (pH 6.13), all the four organic materials significantly increased soil pH ( P < 0.05), but did not greatly affect the exchangeable Al 3+ content. 【Conclusions】 Different organic materials exhibit different regulatory roles in improving the soil fertility in Carya cathayensisforest lands with different yield levels. Application of organic materials improves soil nutrient supply in the forest soils with high-yielding, and could significantly increase soil available nutrients, soil pH, and reduce the toxicity of aluminum in the forest soils with a low-yielding. 注（Note）：同列数值后不同字母代表同一种土壤处理间差异达显著水平 (P < 0.05) Values followed by different small letters represent significant differences at the same soil among treatments ( P < 0.05). 钱新标, 徐温新, 张圆圆, 等. 山核桃果仁微量元素分析初报[J]. 浙江林学院学报, 2009, 26(04): 511–515. 祝小祥, 徐祖祥, 徐进, 等. 临安山核桃主产区土壤理化性状变化的研究[J]. 农学学报, 2014, 4(6): 32–35. Dileep Kumar, A.P. Singh, P. Raha, et al. Potassium humate: a potential soil conditioner and plant growth promoter[J]. International Journal of Agriculture, Environment & Biotechnology, 2013, 6(3): 441–446. 李志鹏, 刘浩, 于晓娜, 等. 黄腐酸对植烟土壤改良及烟叶品质的影响研究[J]. 土壤通报, 2016, 47(4): 914–920. Li Z P, Liu H, Yu X N, et al. Effect of fulvic acid on improvement of tobacco-planted soil and quality of flue-cured tobacco leaves[J]. Chinese Journal of Soil Science, 2016, 47(4): 914–920. 葛振, 魏源送, 刘建伟, 等. 沼渣特性及其资源化利用探究[J]. 中国沼气, 2014, 32(3): 74–82. 肖洋, 李丽, 田里, 等. 东北高寒区沼渣连年施用对玉米产量、效益和土壤肥力的影响[J]. 水土保持学报, 2017, 31(2): 262–266, 300. Xiao Y, Li L, Tian L, et al. Effects of consecutive biogas residue application on maize production, benefit and soil fertility in the cold high-latitude area of northeast China[J]. Journal of Soil and Water Conservation, 2017, 31(2): 262–266, 300. 付丽军, 张爱敏, 王向东, 等. 生物有机肥改良设施蔬菜土壤的研究进展[J]. 中国土壤与肥料, 2017, (3): 1–5. Fu L J, Zhang A M, Wang X D, et al. Advances on application of bio organic fertilizer for restoring facility vegetable soil[J]. Soil and Fertilizer Sciences in China, 2017, (3): 1–5. 孙薇, 钱勋, 付青霞, 等. 生物有机肥对秦巴山区核桃园土壤微生物群落和酶活性的影响[J]. 植物营养与肥料学报, 2013, 19(5): 1224–1233. Sun W, Qian X, Fu Q X, et al. Effects of bio-organic fertilizer on soil microbial community and enzymes activities in walnut orchards of the Qinling-Bashan Region[J]. Journal of Plant Nutrition and Fertilizer, 2013, 19(5): 1224–1233. 卜晓莉, 薛建辉. 生物炭对土壤生境及植物生长影响的研究进展[J]. 生态环境学报, 2014, 23(3): 535–540. 林庆毅, 应介官, 张梦阳, 等. 生物炭对红壤的土壤中不同铝形态及小白菜生长的影响[J]. 沈阳农业大学学报, 2017, 48(4): 445–450. Lin Q Y, Ying J G, Zhang M Y, et al. Effect of biochar application on remission of red soil aluminum different forms and the growth of pakchoi[J]. Journal of Shenyang Agricultural University, 2017, 48(4): 445–450. 沈一凡, 钱进芳, 郑小平, 等. 山核桃中心产区林地土壤肥力的时空变化特征[J]. 林业科学, 2016, 52(7): 1–12. Shen Y F, Qian J F, Zheng X P, et al. Spatial-temporal variation of soil fertility in Chinese walnut (Carya cathayensis) plantation [J]. Scientia Silvae Sinicae, 2016, 52(7): 1–12. 浙江省土壤普查办公室. 浙江土种志[M]. 杭州: 浙江科学技术出版社, 1993. Zhejiang Province Soil Census Office. Zhejiang soil species[M]. Hangzhou: Zhejiang Science and Technology Press, 1993. 石红静, 马闪闪, 赵科理, 等. 有机物料对酸化山核桃林地土壤的改良作用[J]. 浙江农林大学学报, 2017, 34(4): 670–678. Shi H J, Ma S S, Zhao K L, et al. Effect of organic materials on improvement of Carya cathayensis forest acidic soil [J]. Journal of Zhejiang A & F University, 2017, 34(4): 670–678. 鲁如坤. 土壤农业化学分析方法[M]. 北京: 中国农业科技出版社, 2000: 30–163. Lu R K. Analytical methods of soil and agricultural chemistry[M]. Beijing: China Agricultural Science and Technology Press, 2000: 30–163. Slattery W J, Ridley A M, Windsor S M. Ash alkalinity of animal and plant products[J]. Australian Journal of Experimental Agriculture, 1991, 31(31): 321–324. 娄燕宏, 诸葛玉平, 魏猛, 等. 外源有机物料对土壤氮矿化的影响[J]. 土壤通报, 2009, 40(2): 315–320. Lou Y H, ZhuGe Y P, Wei M, et al. Effect of extraneous organic materials on the mineralization of nitrogen in soil[J]. Chinese Journal of Soil Science, 2009, 40(2): 315–320. 鲁彩艳, 陈欣. 有机碳源添加对不同C/N比有机物料氮矿化进程的影响[J]. 中国科学院研究生院学报, 2004, 21(01): 108–112. 李平, 郎漫, 李煜姗, 等. 不同施肥处理对黑土硝化作用和矿化作用的影响[J]. 农业环境科学学报, 2015, 34(7): 1326–1332. Li P, Lang M, Li Y S, et al. Effects of different fertilization on nitrification and mineralization in black soil[J]. Journal of Agro-Environment Science, 2015, 34(7): 1326–1332. Xiao K, Xu J, Tang C, et al. Differences in carbon and nitrogen mineralization in soils of differing initial pH induced by electrokinesis and receiving crop residue amendments[J]. Soil Biology & Biochemistry, 2013, 67: 70–84. 章永松, 林咸永, 罗安程, 等. 有机肥(物)对土壤中磷的活化作用及机理研究—Ⅰ.有机肥(物)对土壤不同形态无机磷的活化作用[J]. 植物营养与肥料学报, 1998, 4(2): 145. 杨丽娟, 李天来, 付时丰, 等. 长期施肥对菜田土壤微量元素有效性的影响[J]. 植物营养与肥料学报, 2006, 12(4): 549–553. 于君宝, 刘景双, 王金达, 等. 典型黑土pH值变化对营养元素有效态含量的影响研究[J]. 土壤通报, 2003, 34(5): 404–408. 杨玉爱, 王珂, 叶正钱, 等. 有机肥料资源及其对微量元素的螯溶和利用的研究[J]. 土壤通报, 1994, (增刊2): 21–25. Yang Y A, Wang K, Ye Z Q, et al. Organic fertilizer resources and their trace elements studies on chelating and utilization[J]. Chinese Journal of Soil Science, 1994, (S1): 21–25. 王擎运, 张佳宝, 赵炳梓, 等. 不同施肥方式对典型壤质潮土中微量元素积累及其有效性的影响[J]. 土壤学报, 2012, 49(6): 1104–1113. Wang Q Y, Zhang J B, Zhao B Z, et al. 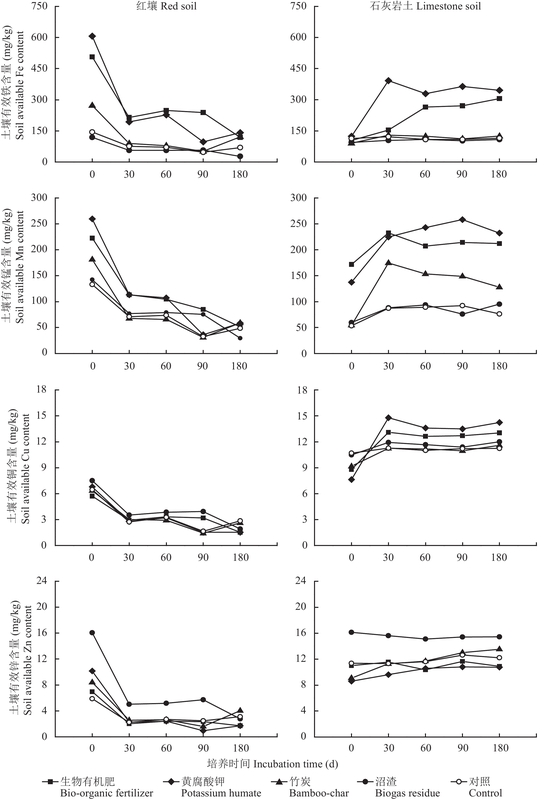 Infuence of different long-term fertilization practices on accumulation and availability of micronutrients in typical loamy fluvo-aquic soil[J]. Acta Pedologica Sinica, 2012, 49(6): 1104–1113. 王龙, 马杰, 邓迎璇, 等. 金属离子在铁(氢)氧化物与腐殖质微界面上的吸附机理和模型研究进展[J]. 农业资源与环境学报, 2017, 34(5): 405–413. Wang L, Ma J, Deng Y X, et al. Micro-interfacial mechanism and model of metal ions adsorption on the iron(hydr) oxides and humic substances: A review[J]. Journal of Agricultural Resources and Environm, 2017, 34(5): 405–413. 马闪闪, 赵科理, 丁立忠, 等. 临安市不同山核桃产区土壤肥力状况的差异性研究[J]. 浙江农林大学学报, 2016, 33(6): 953–960. Ma S S, Zhao K L, Ding L Z, et al. Soil fertility in Carya cathayensis orchards for major towns of Lin’an City, China [J]. Journal of Zhejiang A & F University, 2016, 33(6): 953–960.